Before Madras faced Valley Catholic in the first round of the 4A girls basketball playoffs Friday, the Lady Buffs had won 13 straight. They were undefeated at home. They were a confident bunch, and, they had their sights set on a return to the 4A state tournament in Forest Grove for the second time in three seasons. The two teams were familiar foes. In 2016, the last team standing between Madras and a state tournament berth was Valley Catholic. The Lady Buffs knocked off the Valiants 63-50, and needed to do so again at home in order to get back to Forest Grove. That bad memory was certainly on the minds of Valley players in the the rematch game Friday. During a game of frequent momentum swings, in which neither team led by more than five points, Valley Catholic wrested away the lead from Madras with under two minutes remaining and held on for a 60-57 win. The Lady Buffs pushed their lead to 55-50 at the 2:28 mark in the final period when Kaliyah Iverson drove around a Valiant defender and tossed in a layup. It seemed that Buffs were in great position with a lead and the crowd behind them at home. 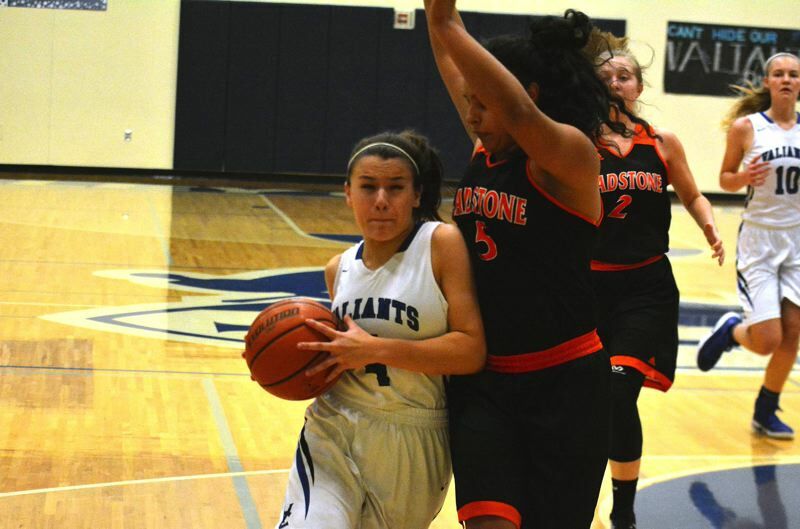 That was until Valiants junior Callie Kawaguchi took matters into her own hands. Kawaguchi first hit a 3-pointer, then a layup to tie the game at 55. At the 1:08 mark, Kawaguchi hit another deep ball and gave Valley Catholic the lead for good. She was reminded of the loss two years ago, when Madras won and ended the careers of seven Valley Catholic seniors, including their leader, Molly Danielson. Kawaguchi didn't want the same ending for this team's lone senior, Noelle Mannen. "I just wanted to do it for the senior leader two years ago and the senior leader now," Kawaguchi said. "I didn't know I could do it, but I just knew I had to find a way. When I was given the opportunity, I didn't really think; I just shot it." Madras missed shots on three straight possessions, and after Kawaguchi hit both free-throw attempts with 26 seconds remaining, Valley Catholic upped its lead to 60-55. With the clock ticking to seven seconds, Iverson rebounded a miss and earned a pair of free throws, both of which she knocked down. Madras then intercepted Valley Catholic's inbounds pass, but rather than attempting a potential game-tying 3-pointer, Madras dribbled inside for a layup that missed. Still, the game wasn't settled quite yet. Madras intentionally fouled Valley Catholic with 2.1 seconds left, and the Valiants missed the front end of a one-and-one. After the Lady Buffs grabbed the rebound and called timeout, they inbounded from the far baseline to senior Lynden Harry, who took a few dribbles and launched a shot from half-court that hit backboard with a chance of going in, but it clanked off the front rim. Valley Catholic survived to play another couple games at the state tournament, while Madras (21-3) was dealt its only home loss of the season. "Their run was later on in the game than ours, and we just didn't have enough time to get that run," Madras head coach Zach Lillebo said. "Valley Catholic has some good athletes, and a kid that just came up big … Basketball is a game of runs, and that's exactly what it was tonight." Similar up-and-down styles of play and standout senior point guards kept Madras and Valley Catholic neck and neck for much of the first half. Harry, who scored 21 points, set the tone for Madras with 11 points through the first two quarters, and helped Madras to a 27-26 halftime lead. Mannen did the same for Valley Catholic, hitting a pair of 3s en route to 12 of her game-high 25 points. "I think our defense kind of lagged in the first half, but there's nothing you can do about it now," Iverson said. "They're a good team." "We did well attacking the basket … We had a lot of layups, stuff like that, and then a couple girls hit their 3s," Harry said. "That was good for us. I just think we needed more defensive intensity … We weren't blocking out in the beginning; we were just kind of letting the ball go wherever. We weren't attacking at all. We let the post get in front of us and get those rebounds. We let Mannen do her thing." Valley Catholic matched its largest lead of five midway through the third quarter when Kawaguchi hit two free throws, but Madras got a big boost from its freshman, Jayden Davis, who heated up in the closing minutes of the third quarter. Davis gravitated to nearly the same spot on the left elbow, and on successive trips down the floor, Harry found her for three wide open 3-pointers. The last one gave Madras a 46-42 edge with 1:21 to in the third period, and prompted to Madras student section to start chanting, "She's a freshman!" "I really wanted to win and go to state for my teammates," said Davis, who scored 11 of her 17 points in the third. "I felt really relaxed shooting it, and hearing the crowd felt good, too." The Buffs turned to their seasoned veterans in the fourth quarter, when Harry matched a Mannen jumper with one of her own at 5:35, flipping yet another tied score in favor of Madras, 50-48. Then Harry and Jackie Zamora combined to hit three of four free throws, and factoring in Iverson's late layup, Madras held a five-point lead and dialed up the volume in the Buffalo Dome. But it didn't last much longer, as Valley Catholic closed the game on a 10-2 run, all of its points coming from Kawaguchi. "The last few minutes I was shaking, I was so scared," Kawaguchi said. "It was crazy in here. It was so loud I called out to my teammates and they couldn't hear me. It was crazy, but it helped fuel all of us, I think, and I'm happy nobody got intimidated by it."